If we’re ever going to truly understand how our Universe works, we’ll need to take lots of different measurements, but measuring can be one of science’s most difficult tasks. How, for example, do scientists measure an invisible thing that passes directly through solid matter without stopping? The inventions scientists come up with to make this possible are often truly incredible—even if the measurements made are totally expected. Today, scientists at the IceCube collaboration are announcing a relatively esoteric but fundamental particle physics measurement: the rate at which the elusive neutrino particles interact with other particles at their highest energies. The result was consistent with physics theory. But it required a telescope buried in a cubic kilometer of South Pole ice pointing down through planet Earth to measure the properties of particles produced on the other side. Did I mention the telescope is at the South Pole? You might remember that atoms are broken into subatomic particles, protons, neutrons, and electrons. But there’s another kind of particle, the neutrino, that barely interacts with regular matter at all; unlike a baseball that gets stopped by a wall, a neutrino can pass through the whole Earth without stopping. But they can slow down a tiny bit. The physicists looked to measure the neutrino cross-section—essentially, how likely these particles are to exchange information with the Earth’s more common particles. It’s like sending a ghost through a crowd and observing the rate at which people were spooked, then measuring whether the spooking tired out the ghost. In this case, scientists only wanted to measure the highest energy neutrinos, those with far more energy than anything created in particle physics experiments like the Large Hadron Collider. The neutrinos originate from the shower of leftovers created when the Earth’s atmosphere stops high energy particles coming in from space. 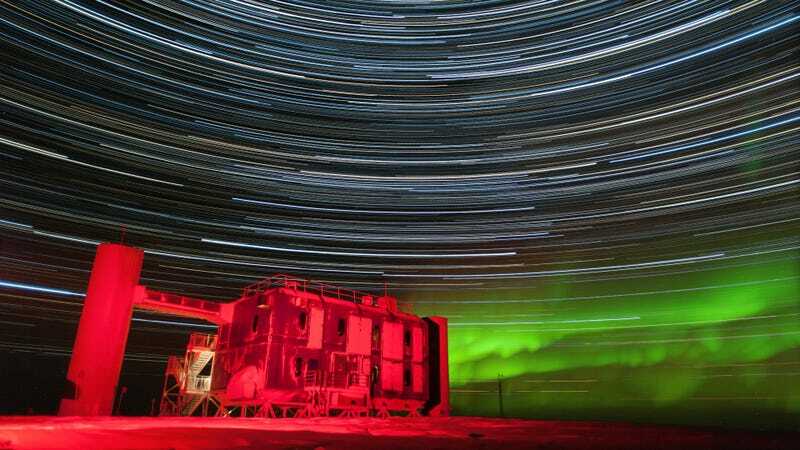 The neutrinos travel through Earth to IceCube—a detector with 5,160 optical sensors embedded in the South Pole’s ice. They might interact with the atoms in the ice and release a far less spooky particle called the muon, like the screams of the few spooked people. These muons, in turn, emit a flash of blue light, detected by the sensors. The scientists calculated the cross section by comparing the tracks of the neutrinos coming up through the Earth (the ones that had to interact a lot) to those coming from horizontally (the ones that barely had to interact at all). Nothing unusual showed up in the measurement—it was in line with what the main particle physics theory, the Standard Model, would have predicted. But that alone is important since it can rule out some wackier theoretical ideas. It also demonstrates that the Standard Model is a pretty good theory. The researchers will continue to refine their measurements—this new paper only accounted for around 10,000 of these super-high-energy neutrinos. They’d like to see what actually happens when the neutrino interacts, while others at the experiment try to understand where neutrinos bombarding Earth from space come from.